With summer in full swing, the city of Montreal comes to life in August with plenty of free events, activities, and celebrations to enjoy around the city. From orchestras performing outdoor concertos to big screens popping up all over town for movie nights under the stars, you're sure to find something to enjoy this year. While you can always spend a few dollars at one of Montreal's numerous sidewalk sales or rent a bicycle to explore one of the best cycling destinations around the city, many of the events and activities offered in Montreal are free to attend including free yoga classes, free admission to the Barbie exhibit at Cours Mont-Royal, ​or a trip to one of Montreal's beaches that stay open throughout most of August. Full Disclosure: no one paid their way onto this editorial list compiled by Evelyn Reid. TripSavvy.com experts are subject to a strict ethics and full disclosure policy, a cornerstone of the network's credibility. Located just north of downtown Montreal in the borough of Le Plateau-Mont-Royal, Parc La Fontaine hosts several free cultural activities throughout the summer. In 2018, free events last through September 6 and include "Brazilian Tuesdays," "Jazz Thursdays," and "Sunday Brunch in Music" at the Espace La Fontaine Chalet-Restaurant Bistro as well as several performances at​ Théâtre de Verdure. As part of an initiative in 2018 to get more citizens (and visitors) to engage with the province's many museums, the government of Quebec dedicated over five million dollars to provide free entry to museums across the region on the first Sunday of each month. In Montreal, the Montreal Museum of Fine Arts, the Musée d'art Contemporain de Montréal, the Canadian Centre for Architecture, the Montreal Holocaust Museum, the McCord Museum, the Musée des maîtres et artisans du Québec, and the Écomusée de la Maison du Fier Monde will all participate in the program in 2018. Additionally, everyone gets into the McCord Museum free as of 5 p.m. every Wednesday and the Redpath Museum is always free of charge. Each year, the Repercussion Theatre of Montreal presents a play by William Shakespeare in various parks across the city, including a performance at Mount Royal Cemetery and one at Parc Jeanne-Mance. In 2018, this professional production company will perform "Romeo and Juliet" from July 5 through August 8. Admission to each show is free, but performances may also be canceled in the event of rain. You can check out the full schedule of performances on the Repercussion Theatre website to see if they'll be performing while you're in town. From Tuesday, August 7 through Wednesday, August 15, 2018, the Montreal First Peoples Festival will return to the Place des Festivals with a series of film screenings, concert performances, cultural events, and seminars as well as showcases of traditional crafts and visual and media arts. This celebration of aboriginal art, history, and culture is free to attend, but some special events will entail a small fee. Each year in mid-August, a group of community organizers in the LGBT community put together what's known as Pervers/Cité (Pervert City), which considers itself "the underside of pride," an expression of radical queerness including a series of events, workshops, panel discussions, and actions that are free to attend. Known as "Les Premiers Vendredis" in French Canada, First Fridays is Montreal's monthly food truck gathering held at the Olympic Park every spring and summer month. You can count on some of the best street foods in the city accompanied by live music from local artists. The event is free to attend but the food and drinks will cost extra. Les Premiers Vendredis will take place starting at 4 p.m. on Friday, August 3, 2018. La Petite Patrie's Little Italy will host the annual Montreal Italian Week from August 3 to 12, 2018. Events will include a free presentation of the opera "La Bohème" at Mastro & San Daniele Stage on Boulevard St-Laurent and the Moda Sotto le Stelle, a fashion show under the stars. There will also be art exhibits, a bocce tournament, cooking lessons, a Fiat 500 car exposition, guided tours of Little Italy, and movies playing throughout the week as part of the Italian Film Festival. The ambiance in the Jean-Talon Market is unbeatable this time of year, so even if you don't spend any money wandering around the over 300 vendors on-site, you're sure to enjoy the sights. Buskers, happy kids, and lots of food and drink converge on this indoor-outdoor market. If it's especially hot, you can grab a handmade ice cream or a pink grapefruit cassis half and half sorbet at the market's Havre-aux-Glaces. The entire month of August is dedicated to archaeology in Quebec, and the city of Montreal will host a variety of free events to celebrate the history of Canada uncovered through archaeological digs. Events include a simulated dig as part of the First Peoples Festival, a special presentation of "Lights Under the City" at Château Ramezay, and a rally at House Le Ber-Le Moyne to discover its unearthed artifacts. Check the official Le Mois de L'Archéologie 2018 website for a full list of events. Virgin Radio & CTV: "Ferdinand" at Recreation Centre in Mount Royal on August 8 and "Ocean's 8" at George O'Reilly Park in Verdun on August 22. Cin'Hoch at Promenades Hochelaga-Maisonneuve: "Ego Trip" on August 3, "Les Affemés (The Hungry)" on August 10, and "Hochelaga Terre des Âmes (Land of Souls)" on August 17. Cinéma Urban at the Place de la Paix: "Do the Right Thing" on August 7, "Le Grand Bleu (The Big Blue)" on August 14, "Crash Test Anglaé" on August 21, and "Taste of Cement" on August 28. Lesbian Movie Nights: On Tuesdays at nightfall in the Gay Village June 6 through August 28. As many of these films are not in English or are played with French subtitles, you should always check the fine print before heading out, especially if you aren't that fluent in French. Every week, drummers, dancers, musicians, and free-spirited folks of all ages and ethnicities gather at Parc Mont-Royal for the drum circle known as the Tam-Tams. Everyone is encouraged to join in the drum circle, whether dancer or drummer, but you can also watch comfortably from the sidelines and no one will judge you. The surrounding park is also a great place to have a picnic with a great view of the city. The Tam-Tams takes place around the George-Étienne Cartier Monument in Parc Mont-Royal on Sundays starting at 10 a.m.
Les Jardin Gamelin (Gamelin Gardens) returns to the Quartier des Spectacles on May 17 and run through September 30, 2018, with a special line-up of community-driven cultural activities, events, and workshops. Free events at Place Émilie-Gamelin include DJ music shows on Thursdays, Brazilian music on Wednesdays, and game nights on Sundays all month long. If you're a fan of muscle cars and classic roadsters, the Gibeau Orange Julep diner hosts a cruise night every Wednesday night all summer long. Featuring custom cars, hot rods, and a one-of-a-kind beverage at the restaurant, "Hot Summer Nights" is a great way to spend the evening with your family—especially if it's full of car enthusiasts. Le Virée Classique OSM Festival is an annual festival of musical performances that runs from August 29 through September 2, 2018, featuring free outdoor performances including a large opening concert at the esplanade of the Olympic Park performed by the Orchestre Symphonique de Montréal, Arhcitek Percussion and the Saxology Ensemble at the Cultural Space Georges-Émile-Lapalme, and the Piazzolla Concert at the Grand Place Complexe Desjardins. If you're in the mood for a fiery circus act, the best place in town is TOHU, which is located at the Cité des arts du Cirque. This creative performance and circus space will feature live world music, clown acts, stunts, and a variety of activities for the whole family at the annual FALLA de Saint-Michel celebration, which starts August 9 and all burns down on August 11, 2018. The Japanese Canadian Cultural Centre of Montreal's annual Matsuri Japon Festival features martial arts demonstrations, dance performances, Taiko drummers, and Japanese food on August 11, 2018. Kids will enjoy taking part in traditional Japanese activities like yo-yo fishing, origami crafting, sumo wrestling, and Daruma otoshi (doll-making) while adults and children alike can enjoy Kyudo (Japanese archery), Taiko (Japanese drumming), and Bon Odiro, a big dance event held during Obon. For over 20 years, artists from around the globe have gathered in Montreal to celebrate the annual Under Pressure International Graffiti Convention in Montreal. In 2018, the event takes place from August 8 to 12 on Ste. Catherine Street East between Ste. Élizabeth Street and Berger. Dozens of organizers, street artists, graffiti writers, DJs, MCs, and urban dancers are expected to gather, create, and celebrate for four full days of events. A celebration of the LBGTQ community of Canada comes to Montreal for Pride Week 2018 from Thursday, August 9 through Sunday, August 19, 2018. Known as Fierté Montreal, Montreal Gay Pride features several free events including a free concert series that kicks off with "Illusion" at Parc des Faubourgs that features over 30 drag queens led by Montreal nightlife icon Michel Dorion. You also won't want to miss the Montreal Pride Parade, which takes place on August 19 along René-Lévesque Boulevard, or the L March on August 12, which is one of the largest political demonstrations in the country for women of the sexual and gender diverse communities. The Notre-Dame-de-Grâce ​(NDG) Arts Week is bigger and better than ever in 2018, running August 20 to August 26 with lots of free events and activities including live opera, tango, and comedy spread out across various parks and landmarks in the Notre-Dame-de-Grâce neighborhood. Founded in 2009, this annual event is a celebration of the thriving arts, music, and creative community of NDG with over 10,000 participants expected each year. 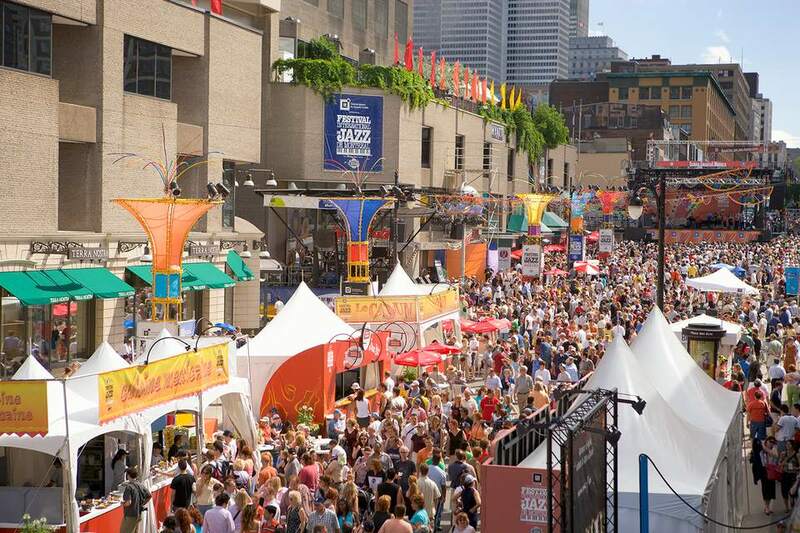 From August 20 through August 25, 2018, the Montreal Fashion and Design Festival features outdoor catwalks at Place des Festivals, an adjacent shopping and exhibitor section, and special conferences. Past talks included former "Fashion Television" host Jeanne Beker, bandage dress creator Hervé Léger, and Scott Schuman, the man behind "The Sartorialist." L’Oasis Musicale: Christchurch Cathedral's free Saturday afternoon classical music concerts starting at 4:30 p.m. and on Sundays at St. George's Anglican Church downtown starting at 2 p.m.
MUTEK: On August 22 to 26, 2018, the experimental audiovisual festival will feature free DJ sessions and digital performances from 5 p.m. to 11 p.m. in Place des Festivals. No matter where you're staying in Montreal, you're sure to find some outdoor adventure or indoor activity you can do for free this August. You can wander fresh flowers, herbs, and other exotic plants at the Verdun Greenhouses or witness the site of thousands of miracles at St. Joseph's Oratory, which is free to visit at any time. Parc Jean-Drapeau's Jean-Doré Beach and Aquatic Complex both propose Free Wednesdays for swimming all summer long for ages 12 and under with the purchase of one adult ticket while the Lachine Canal is one of Montreal's crowning jewels, which you can roam around for free. If you're more into base jumping, water gun fighting, free climbing, and BMX biking, you can head to the Jackalope festival in late August, or check out free entertainment all summer long at the Montreal Boardwalk Village au Pied-du-Courant.